Carob: whether the product is really useful? In view of the universal obsession with a healthy diet and a decrease in total caloric intake becomes more and more popular once the product is unknown to us - carob. Carob (in other locust tree pod Constantinople, Johns bread) - the powder obtained from the pods of the carob bean. Homeland Carob assumed Srednezemnomore. It annually produces about 135 000 tons of powder from the dried pods. 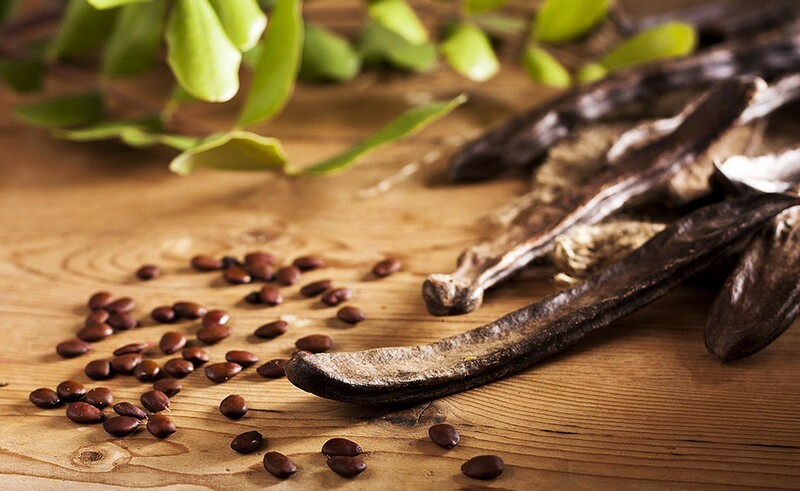 The main supplier of Carob in Europe - Spain. Directly carob beans are sweet (50% of sugars) and juicy pulp, they are often compared with the cocoa beans (carob is a bit like the taste of cocoa powder, but unlike cocoa, the first has a sweet taste, slightly astringent and spicy). Sometimes roasted and unroasted. Carob currently widely used in confectionery (candy, a variety of paste glaze, chocolate, biscuits, cakes, biscuits), as well as in products for diabetics. The apparent advantage of its sweet taste (which significantly reduces the consumption of sugar or completely eliminates the need to use it). First, carob truly rich in vitamins (A, B, V2, V3 and D) and minerals (large amounts of calcium, phosphorus, potassium and magnesium, and it contains a udobousvoyaemoy to the body shape of iron, copper, nickel and manganese, and barium). Also, carob is a good source of fiber, it contains tannins that bind and remove toxins. The composition of the product - a low percentage of body fat (which allows him to be considered a diet). Unlike cocoa, Carob contains no psychotropic substances, like theobromine and caffeineWhich are in chocolate - they are able to improve mental alertness and addictive. There is little in the Carob cholesterol and fats, as I remarked earlier; contains oxalate, calcium-binding, and promote the formation of kidney stones. And to top it all, it does not have the carob chocolate allergenicity. The carob, unlike chocolate, no oxalic acidWhich does not allow the body to use calcium and zinc. And these minerals are needed for healthy skin - which is why excessive consumption of chocolate is considered to be one of the causes of acne and acne. There is also no information about the presence of carob salsolinola which is present in chocolate, and is known to be involved in the development of addiction. Products containing carob in the composition, is resistant to oxidation. After all, under the influence of environmental factors (light, heat) fats are oxidized property. Thus, there is an unpleasant taste rancid. Carob Also, since almost no fat (0,7 100 g per gram of product), it is resistant to oxidation, which significantly increases the shelf life. Therefore, more and more often in the food industry Carob replaced 15-30% cocoa without changing the taste of the final product (slab chocolate, chocolate icing, cupcakes, ice cream, semi-finished products for cakes, biscuits). Information about the dangers of Carob no. But in order to avoid an allergic reaction, it is better not to abuse the product and, if necessary, pass the test for individual intolerance. Melt cocoa butter in a water bath. Stir, add the chopped nuts and carob / dried fruit. Once again mix well, spread on a lot of molds, a little cool and put in the freezer for about an hour to complete hardening. Sift in a bowl the flour, baking powder, cinnamon and carob. In the circle, combine the honey / syrup, butter and milk. Pour the liquid into the dry mixture and whisk whisk 2 minutes. Put the dough into the molds and bake 20-25 180 minutes at grad. Let cool, then remove from the molds. All the ingredients in a blender grind or chop them with a knife (you can, as an option, scroll through a meat grinder). Add the carob and honey or syrup. Mix and tamp in a square shape. Send 1 in the freezer for an hour. Once cut into slices. Store in the refrigerator. Flakes can be pre-fill with water for several minutes, then drain any excess liquid. The blender mix and grind everything except the oil and syrup until homogeneous. In a separate container, mix coconut oil and Jerusalem artichoke syrup, and then connect the two mixtures. Beat 1 minute. From this "test" balls roll, roll in carob, coconut or cocoa. Store in the refrigerator.